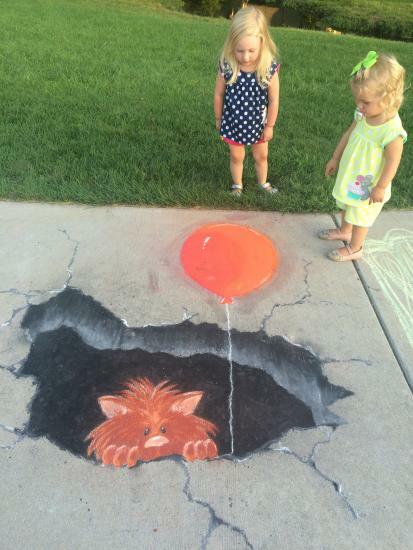 Creative artists from all over the area will be coming together with their chalk in hand on Saturday, July 29th. 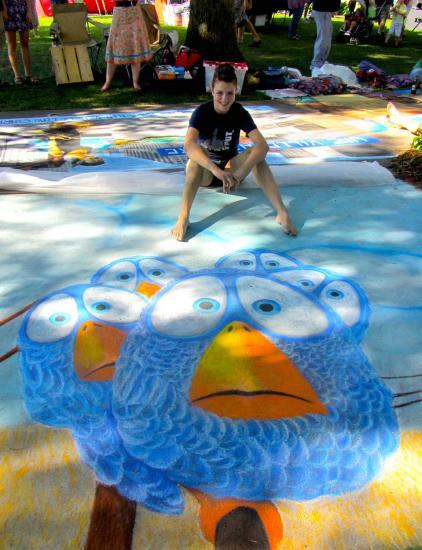 It is a daylong event in which the sidewalks of the UW-Eau Claire campus mall transform into canvases. Each piece is an intricate masterpiece with depth and dimension that leaves people of all ages in awe. All day long these artists will be busy working and as they are creating thousands of people will be strolling past. It is an experience like none other. Of course, while you are there mesmerized by the talent you are witnessing you will most likely work up an appetite. Lucky for you there will be food to keep your hunger at bay. Along with the food, there will be music and chalk related games such as a Pictionary tournament and artist duels! 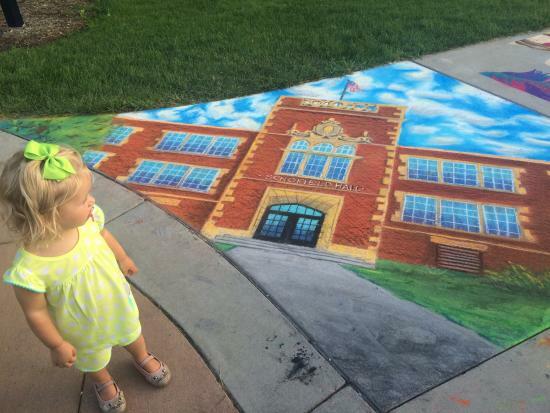 Chalkfest participants must be 12 years or older, however, young artist are encouraged to come and participate in the kids’ sidewalk mural! $3 can get the kids a small box of chalk to use. It truly is an event for everyone! At the end of the day, the artwork will be judged and winners will be announced in different categories ranging from audience choice, adult selections, and youth selections. 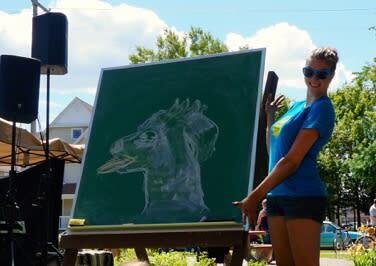 I’ve gone to Chalkfest in the past and had a few questions that I wanted an insider’s perspective on! Lucky for me, Kaylee Hochstetler, a local art teacher at Robbins Elementary School volunteered to let me pick her brain. Check out her answers to the following questions! Q. 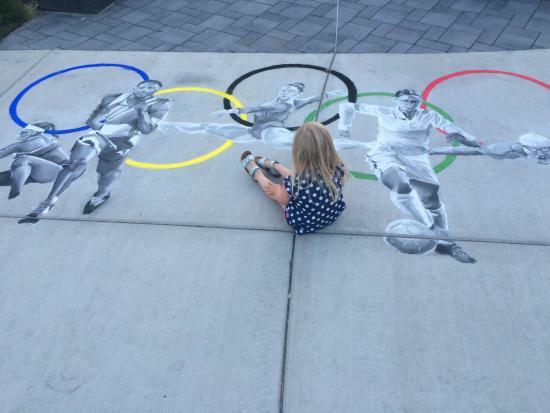 How long have you been participating in Chalkfest? 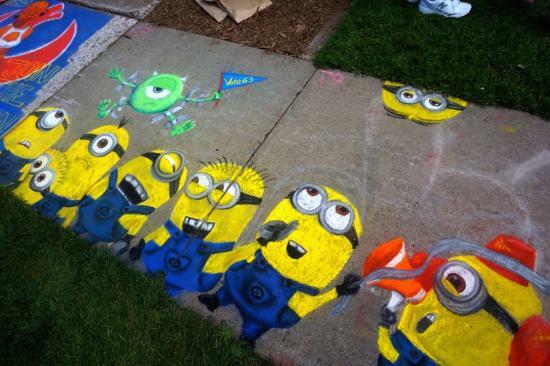 This will be my 6th Chalkfest. My first was back in 2012 and I’ve done it every year since then! I’ve also had the same friend and fellow artist with me every year- Jamie Zerbe. This will be our 4th consecutive year creating side-by-side sidewalk spaces. We keep each other in check and remind each other to take breaks, drink water and laugh. In years past, I have seen grids on the sidewalk on a few different pieces. I learned that in preparation for Chalkfest, some artists sketch a smaller version beforehand and then they scale it up on the sidewalk using a grid system. Since every artist is different, this led me to my next question for Kaylee. Q: What things do you do to prepare for chalkfest? I usually draw a small sketch and print a few pictures to reference for the day. I go through ALL of my boxes to make sure I have enough chalk. I have a bin of regular side-walk chalk and several packs of chalk pastels. I also bring baby wipes, water, and sunscreen. I try not to doodle too much beforehand or I’ll end up overthinking it. Q: How does it feel to have thousands of people walking past as you are creating your piece? Q: What is your favorite thing about Chalkfest? I love having that moment set aside for me to create! I come there knowing I’m going to be able to dedicate my time and efforts to something I love doing. I have this giant blank space, beautiful new (and old reliable) materials, and a community of support. Just knowing it’s coming every year makes me giddy! Q: Any advice for others who are interested in registering? Those that do register are given a choice of a 6x6 square for $20 or a 6x12 rectangle for $25. Upon registering the artist will also receive a box of 48 color artist chalk, a sponge for blending, and a set of gloves. 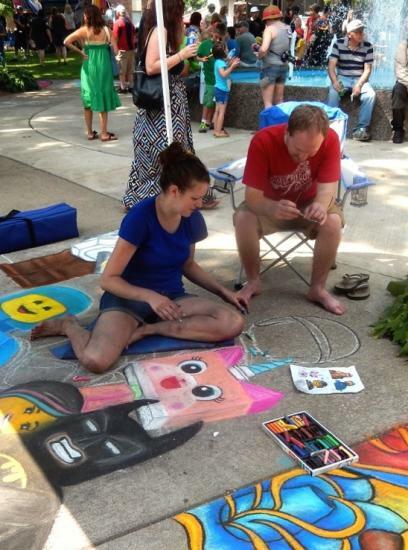 They also have the option of buy additional supplies at Chalkfest. Fun fact: All of Chalkfest’s chalk is non-toxic and environmentally friendly! 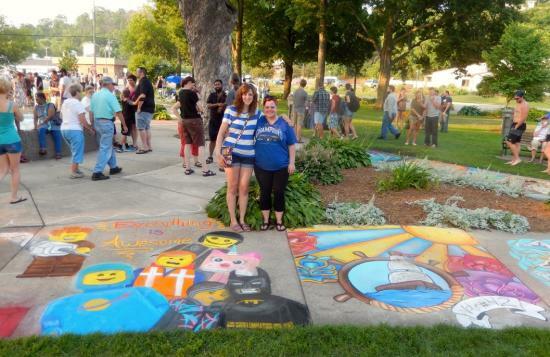 Need more information or are you curious about pre-registering to reserve your spot at Chalkfest? Feel free to contact Kristin Schumacher at UWEC (schumakf@uwec.edu) or Volume One at localstore@volumeone.org.